Started Hemsdale sweater from Dale of Norway this morning but didn't get beyond 16 rows of the inside cuff. Errands called us out into the 14 degree F very windy day but the snow was beautiful and felt kind of nice to be cold again rather than Maine at 60 degrees in the winter! A stop at Water Street Yarns in Hallowell Maine just seemed to happen. Hard to get up into that area and not stop at this small but exceptional shop. 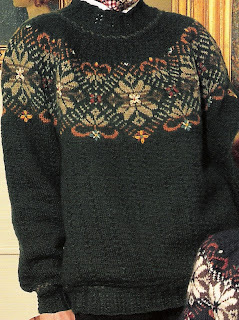 I've been looking for the Dale book #79 which has a sweater with a moose on it I like. She didn't have that book but did have #85B which just screamed at me to take it home. I absolutely love the sweater pictured here. It has tiny cables up to the yoke and then over the yoke. What to do? What to do? Want to bet I switch from Hemsdale to this one? I've knit so many dropped shoulder sweaters lately that a yoke might be just what I need to do. I just posted a message to the group about that exact same sweater-Isn't it beautiful? If I ever find some copies, I will let you know. I am over in VT-anybody else from the NE on the KAL? I think there is someone in MA at least. Love your Dale photo! I love yoke sweaters but I haven't knit one in a long time. The tiny cables in the yoke sound beautiful. Glad to hear Maine is getting real winter now. That's a beauty! Oh, don't show me any more, they are all so lovely! That one is really beautiful. So many beautiful sweaters so little time. I have been looking for that pattern!! Do you know if she has any more? Is there a web address or phone # so I could order one? I think it is an especially pretty Dale sweater. Me, too! Want the pattern - or kit - that is. Is it in #85B? The yoke sweater is in Dale Design book #85B. It was the only copy at the yarn store unfortunately. Ebay maybe?